We recently commissioned a research report by Ian Smith – Re-thinking the English Indices of Multiple Deprivation. Here, Ian explores some of the key thinking that came out of his work. There has been a lot of interest in measuring disadvantage over the past 20 years and the the fifth iteration of the English Indices of Multiple Deprivation (IMD) is to be reviewed over the next 12 months. Clearly disadvantage is a complex thing and can be represented in different ways. As a geographer I am particularly interested in area-based assessments of disadvantage. I know such measures are problematic but what indicators are not? The English IMD is a second-generation indicator of area-based deprivation that represents 7 ‘dimensions’ of disadvantage from worklessness to housing affordability, from health to distance from your nearest post office. It is ‘second generation’ because it is not solely dependent on small area census data (as ‘first generation’ indices are/were) but is based on a range of small area administrative and census data from different sources within English government. I am a fan. It is lovely – both because of its breadth of content but also because of its regular, statistically-ordered lower super output areas (LSOAs) that sometimes get conflated for neighbourhoods. An indicator, however, is a conceptual model of a real concept. As George Box pointed out – all models are wrong, but some are useful. For this research, we posed the question: how useful is the IMD to Power to Change? To answer it, we created a set of dimensions to help us think about how an indicator (a statistical instrument ‘designed’ to perform a task) is constructed and deployed. We asked people in Power to Change how they used the IMD and what was their assessment of the strengths and weaknesses for what they needed it to do: investing in community businesses that alleviate disadvantage in England. What struck us was that the IMD tended to be used mainly in its top-line indicator format – what was being missed was the opportunity to use the IMD as an indicator system that can be moulded to the specific objectives of an organisation. We compared the top-line IMD indicator with a bespoke ‘Better Places’ indicator inclusive of the health disability, education and access to services dimensions (in line with Power to Change priorities) for LSOAs in Suffolk and Liverpool. 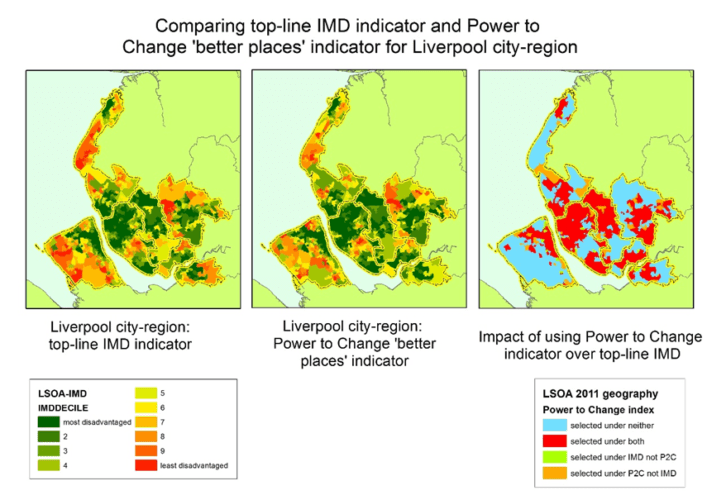 The left-hand side and middle maps in both Figures 1 and 2 show neighbourhoods marked relative to the top-line IMD indicator where the deepest green areas are the most disadvantaged. The right-hand map in these Figures shows the differences with the red areas being the most disadvantaged 30% under both indicators and the blue being ‘advantaged’. However, the orange areas are marked as disadvantaged under the ‘better places’ indicator but not under the top-line IMD. Under this measure Suffolk LSOAs become more disadvantaged. In fact nearly 50% fall under the 30% most disadvantaged in England. Whereas Liverpool changes very little under the new formulation with most neighbourhoods remaining ‘disadvantaged’. Clustering the LSOAs ranking on the top-line IMD indicator and the ‘Better Places’ indicator we captured how patterns of disadvantage form broad regions and compared outlier neighbourhoods to capture differences within these wider clusters. On Figures 3 and 4 the LSOAs marked in red are ones that appear as advantaged, yellow as in-between or non-identifiable and blue as disadvantaged. 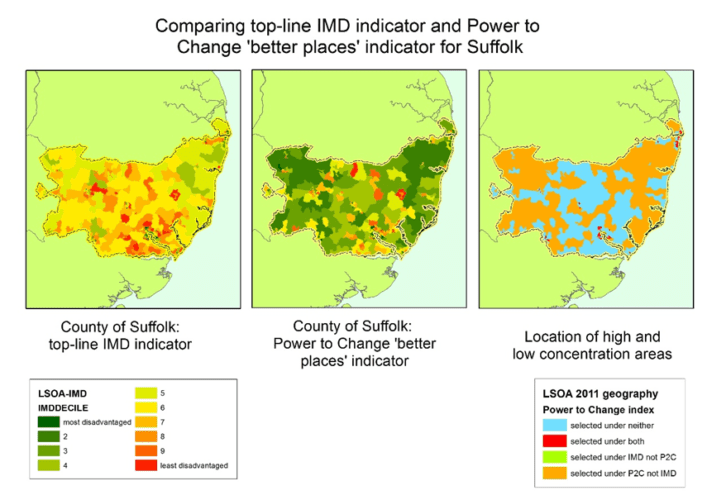 The left-hand maps shows the clustering of indicator ranking in relation to Suffolk. 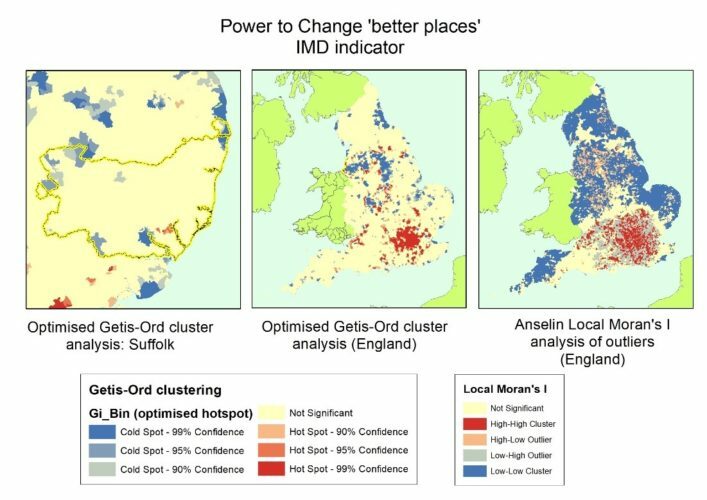 The middle map shows the Getis-Ord clustering for England as a whole whilst the right-hand map shows the Local Moran’s I maps which shows where areas are located as outliers in wider regions. The aim of the exercise is not to rubbish the general top-line IMD. It is still useful to Power to Change in a general sense. However, the research draws attention to the fact that Power to Change could use the IMD in a more intelligent way. For example, the East and North of London is clearly a region with many disadvantaged areas. But, if the aim of the exercise is to invest in community businesses that improve access to services, health and educational outcomes, there might be better areas to focus investment. If you want to read more about our work with Power to Change, please download the report- https://powertochange.staging.wpengine.com/research/re-thinking-english-indices-multiple-deprivation/ . Smith, I, Green, E, Whittard, D. and Ritchie, F. (2018) Re-thinking the indices of multiple deprivation (for England): a review and exploration of alternative/complementary area-based indicator systems. Final Report. Bristol Centre for Economics and Finance (BCEF) in the Bristol Business School at the University of the West of England (UWE).